Why is it when you watch a horror movie, the person that bites the dust always is in the woods or descending into a basement? Those people clearly have no idea how much a good remodel or finishing can add to their home’s value! I have seen some pretty crazy basements in the PDX area (hello strange coffin), but I have also seen some well finished living areas created in what formerly could be seen as a creepy space or storage dumping ground. If you are considering finishing off your basement, whether for your own recreation or in preparation of selling, here are some things to keep in mind. This one is fairly common sense, so I will keep it short and sweet. Always check to see what your county’s code requirements are for building permits. Is this fun? No! Yet necessary, especially if you would like to see that value come back higher on your home. Sometimes the right path isn’t always the most fun path, but this is not the time to do now and ask for forgiveness later. Don’t mess around when it comes to making sure your codes are intact for things like structural integrity, electrical changes, and plumbing. It will save you and potential buyers from heartache down the line. Prior to beginning your basement remodel adventure, take the time to ascertain whether there are any water issues that need to be dealt with. Begin outside, checking to make sure that the ground is graded away from the foundation, that there are no cracks or deterioration in the foundation itself. Inside, look for obvious signs of water damage like dripping water coming through the below grade walls. Once any moisture issues have been addressed, you may consider putting a vapor barrier on to the walls and floors prior to framing and finishing off those surfaces. Let the barrier sit for a few days before progressing with the project so that you can look and see how much moisture may be coming through. Insulating your basement has many benefits. In addition to helping keep the warmth in, it also may act as another layer of moisture control, and a way of muting some of the sounds coming from outside of the basement. There are various types of insulation, so I would consult with someone who knows a lot about it when deciding which type would work best. We talked about vapor barriers earlier. Did you know there is insulation that comes with vapor barriers included on both sides? Talk about getting two birds with one stone! Going back to the fun of knowing our codes, it is good to know that when it comes to your areas that house your HVAC unit or water heaters (etc) that there are specific code requirements for spacing and framing. Also keep in mind that these units will eventually need to have access for inspections or repairs. Best way to deal with this? Keep this area clear and unfinished, or consult with a contractor on how you can hide them while still being code compliant. One option may be to put in a drop or suspended ceiling. While it isn’t necessarily the most fashionable, it does cover up the electrical and plumbing while still providing access for maintenance. It always seems like the fun part of a remodel is towards the end, when you get to think about the style you want to create. For a basement remodel, the fun may be in picking out what kind of cabinetry or paint color you want to have for the mother in law suite. Or maybe it is how big of a pool table you can fit in the rec room. We tend to want to skip to the fun part and ignore some of the details that could make a difference in functionality. When it comes to finishing or remodeling a basement, functionality can be found in many areas. For example, when framing the room, what kind of fasteners are appropriate to use for your structure? This is important as many times, a basement’s outlying structure is made of some sort of masonry. Where are your access points? If using as a living quarters, how are you constructing the doorway to get in and out of that unit? What are you going to do about lighting? Are there already basement windows, or will you be wanting to add some for lighting purposes? Adding recessed lighting may be beneficial as it does not take up too much overhead space, and is easy to install in a drop ceiling. Feel overwhelmed? Finishing or remodeling a basement is a big task, however it doesn’t need to be a headache. Hopefully this has provided some good information to consider, and a starting point for your research on where to begin. 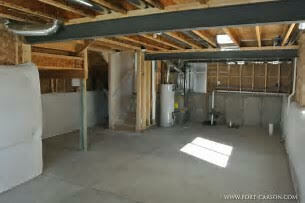 If you were to remodel a basement, what would you do with the space? How would you make it your own?